VLADIVOSTOK, July 24. /TASS/. 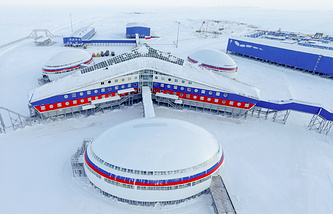 Crews of the military aviation of the East Military District, which are on duty in the Arctic zone, delivered cargo to the distanced garrisons on the Vrangel Island and Schmidt Cape in extreme conditions, the military district's press service said on Monday. "Mil Mi-26 and Mi-8 helicopters have delivered eleven tonnes of cargo and personnel for rotation on the Vrangel Island and Schmidt Cape, the press service said. "Besides, the helicopters have brought an ecology platoon, which will be clearing territory of the Vrangel Island." The routes crossed several big mountain passes with complicated weather conditions - low temperatures and stormy winds, which require highest skills from the crew, the press service added.